Pushkar is all about a semicircular lake with 52 'ghats'. The maximum depth of the lake is 10mteres. It is a holy place and is known as king of all 'tiraths'. A holy dip in this lake on Karthik Purnima is said to wash all the sins and leads to salvation. It is said that the one who bathes in this holy water during the brighter fortnight of the Hindu calendar month Karthik and sees a Varah (an incarnation of Vishnu), will not take a rebirth on this planet again and can enjoy the heavenly bliss forever. The Karthik Purnima holy dip in this lake gives one a blessing equal to hundred penances. There are many yojana spots which cannot be counted by the teacher of gods, Brihaspati.How the name Pushkar came as a mythological story behind it. Once Lord Brahma was worried over the matter of not being prayed to on the earth like the other Gods. He had the desire to have a place on his name on the earth. So he threw a lotus flower which fell on three places and water sprang out from there miraculously. The first place where the flower fell is known as the Jyeshtha Pushkar, the second place is the Madhya Pushkar, and the third place is the Kanishtha Pushkar or Senior, Middle and the Junior respectively. 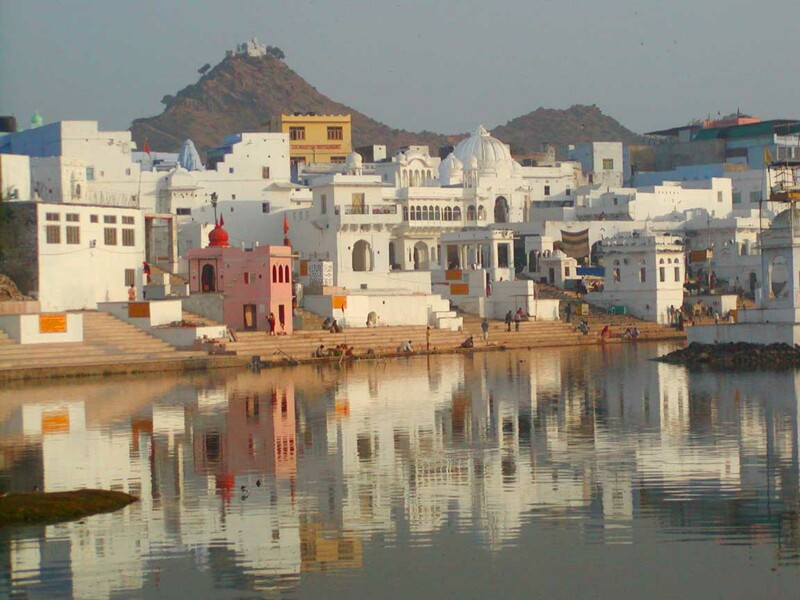 Brahma threw the flower that is the 'Pushpa' with his own hands that is the 'Kar', therefore the name of this place became Pushkar.There are 52 bathing ghats built around the lake. The water of each ghats is supposed to have special powers. Some of which are the Nag Kund for fertility, Roop tirath for beauty, Kapil vyapi Kund water helps cure leprosy and dip in the Mirakand Muni Kund grants the boon of wisdom. Every year on the day of Karthik Purnima, that is the full moon day in the month of Karthik (somewhere in October - November), the famous Pushkar fair is held here. People from all over the country come to take the holy dip. The town comes alive with folk dancers and musicians who come from all the regions to show their talent. Joyful celebration, cultural variety and cattle market make Pushkar fair famous. 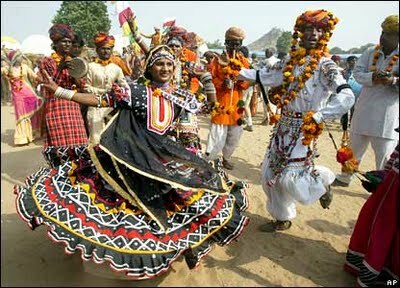 This fair is one of the major cultural reflectors of the state of Rajasthan. This is a five day affair when the small town comes alive with cultural activities and vibrant energy.Apart from the religious rituals at the Jagat Pita Shri Brahma Mandir, and other festivities, people participate in a number of sporting and cultural events. The great attraction of this fair other than the variety of folk dances and songs that fill the atmosphere is the camel race and the cattle fair. Cows, Buffaloes, Camels, Horses and even Donkeys are bargained for. This special fair attracts tourists from all over the world. Location: 11 Kilometers from Ajmer, on the edge of the desert, lies the tiny tranquil town of Pushkar, long the bank of a picturesque Pushkar lake. It is an important pilgrimage spot. The Nag pahar or the snake mountain forms a natural boundary between Ajmer and Pushkar. Importance:World famous for the annual Camel fair and the only Lord Brahma temple. The temple is situated on the Ratnagiri Hill and is dedicated to Goddess Savitri, the wife of Lord Brahma. An interesting legend is attached to the temple. Once Lord Brahma had to perform a 'Yagna' (a holy rite to appease gods) on a very short notice. Since he could not do this without his wife, he married Gayatri, a local milkmaid after purifying her. When Savitri came to know of all this, she was furious and cursed her husband that he would never be worshipped anywhere except in Pushkar and that too only once a year. She then left for the Ratnagiri Hill and performed self-immolation. Pushkar Lake is said to be very sacred and has said to be originated when the petals from Lord Brahma's lotus fell on the earth and a lake of clear blue water emerged at its place. 500 temples, 52 palaces, and 52 ghats surround the lake. It is at this lake that the world-renowned Pushkar fair is organized on the occasion of Kartik Purnima every year. The pushkar bagh is an exceptional example of elegance and symmetry in Indian architecture of the last century. The entire bagh is carved out of the famous pink sandstone of Jodhpur it exquisitely captures the romance and grace of a bygone era. The Pushkar Bagh courtyards are peaceful havens where guests can unwind for the day and spend the afternoon leisurely reading or relaxing while capturing the panoramic view of mountains and desert. Hotel The park city is located in central Pushkar, opposite the city bus stand and next to a gurudwara, with the Pushkar Lake 5 minutes down the road. The rooms are comfortably appointed with all modern amenities and attached with balconies which have great views of a garden. The rooftop restaurant is ideal for dinner as it overlooks the Pushkar Lake . Hotel Pushkar Palace has well appointed 48 Super Deluxe Rooms and 5 Suites with all facilities in the rooms. Hotel has two floors, most of the rooms including all suites are overlooking the lake and has garden view. 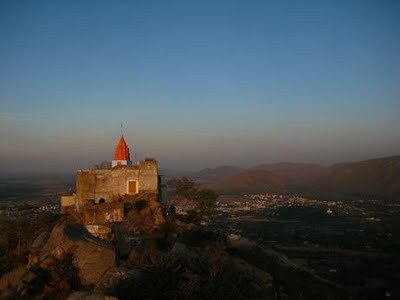 Teerth Palace Pushkar is in a good and peaceful location, quite suitable for all guests coming to Pushkar. Either you come here for business purpose or sightseeing, you can relax in this comfortable hotel.A warm greeting, a welcoming smile and dedicated reception at the hotel lobby offer you an experience of visiting and staying at the hotel.